The bombing, which killed 85 and injured hundreds, is believed to have been authorized by Iran and carried out by its terror proxy Hezbollah. Nisman's indictment implicated numerous high-profile Iranian officials in the attack and prompted Interpol to issue "red notices" for their arrests. Nisman, who was found shot in the head in his apartment just hours before he was scheduled to provide testimony against Argentine President Cristina Kirchner last Monday, had denied the Free Beacon story in 2013 and suggested that Rouhani played no role in the attack. "There is no evidence, according to the AMIA case file, of the involvement of Hassan Rouhani in any terrorist attack," Nisman told the Times of Israel in response to the article. However, Nisman said privately he had evidence that Rouhani was involved in the decision to authorize the bombing, according to Miami Herald reporter Andres Oppenheimer. "In several telephone conversations and email exchanges I had with Nisman over the past three years, the prosecutor told me that Rouhani was among the top Iranian officials who had ‘participated in the decision' to bomb the AMIA Jewish community center in Buenos Aires," Oppenheimer wrote after Nisman’s death. 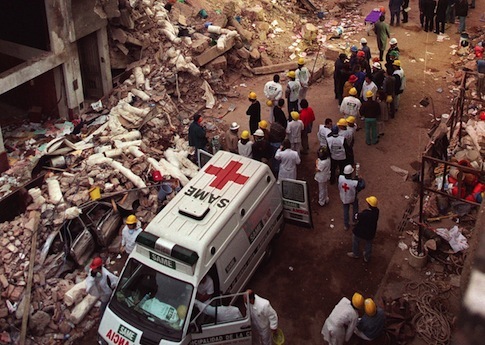 Earlier this month, Nisman accused Kirchner of impeding investigations into Iran's role in the AMIA bombing in exchange for lucrative trade deals. Nisman was found dead from a gunshot to the head in his apartment hours before he was scheduled to present evidence of his allegations against Kirchner to Argentine lawmakers. Kirchner initially said the death was a suicide. She now says she believes Nisman was killed by a "rogue" government agent. This entry was posted in National Security and tagged 1994 Argentina bombing, Argentina, Cristina Kirchner, Hassan Rouhani, Iran. Bookmark the permalink.